Faculty, Staff and Students attended the AIAA Region I YPSE-07 conference at the Johns Hopkins University Applied Physics Lab in Laurel, Maryland. 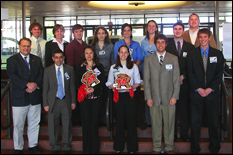 The Baltimore Section of AIAA (American Institute of Aeronautics and Astronautics) once again organized the Region I Young Professional, Student and Education Conference (YPSE-07) on November 2, 2007 at The Johns Hopkins University Applied Physics Laboratory, in Laurel, Md. YPSE-07 provided young professionals and students the opportunity to present a work in progress, and network with their peers in the aerospace industry; the conference is also a place where more established professionals (those not in the AIAA Young Professional designation of 35 years old and younger) can share their broad experience with rising professionals. Recruiting and information tables by several local companies were present at the event. Universities represented in the student presentation competition included: Syracuse University, Penn State University, Princeton University, Old Dominion University, Virginia Commonwealth University, Cornell University, National Institute of Aerospace/UM, Johns Hopkins University, University of Maryland Eastern Shore (UMES), and University of Maryland, College Park. Several Clark School students in Aerospace Engineering took home awards. Nick Rosenfeld, "Linear Time Periodic Structural Stability of Flapping Wings for Micro Air Vehicles." University of Maryland, College Park. (Advisor. N. Wereley). Kunal Kothari, "Consolidation of Gamma Titanium Aluminides for High Temperature Structural Applications." University of Maryland, College Park. (Advisor. N. Wereley). Ted Bubert, "Design and Fabrication of a Passive High-Strain Morphing Aircraft Skin." University of Maryland, College Park. (Advisor. N. Wereley). No third place award was given. Michael F. Gentry, "Effects of Braid Angle on Pneumatic Artificial Muscle Actuator Performance." University of Maryland, College Park. (Advisor. N. Wereley). Ryan J. Murphy, "A Method for the Extraction of Insect Free-Flight Kinematics." University of Maryland, College Park. (Advisor. S. Humbert). Aerospace Engineering faculty and staff were also in attendance at the conference including: Nicole Roop, Rosalia Newman, Dr. Alison Flatau and Dr. Norm Wereley.